I don't make biscuits often, tho' curiously I've made them twice this week. Both these and Kentucky Biscuits, also from this site, were winners. Tender, fluffy and light, these are equally as good warm with butter as they are without. This recipe, unlike the other, did not call for any sugar - I didn't miss it, so why add it? Rather than shortening I used cold butter from the fridge and grated it into the flour with a box grater. That made quick work of blending it! I do have self-rising flour, but I was too lazy to dig it out from the pantry. A cup of all-purpose flour mixed with 1-1/2 tsp. baking powder and 1/4 tsp. salt did the trick. I did NOT knead for two minutes - just a few turns is what I did, because I did not want to overwork the dough. 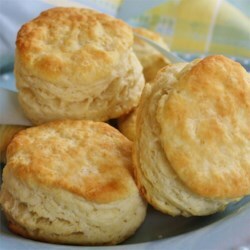 I swear, THAT and buttermilk, are the secrets to a fine biscuit! Once again, I regrettably only made a half recipe. Thankfully, another half recipe can be mixed up in a jiffy! Note: I was also too lazy to dig out my rolling pin and roll them out. Patting the dough out with my fingers seemed to work just fine.